is anything really exponentially distributed? 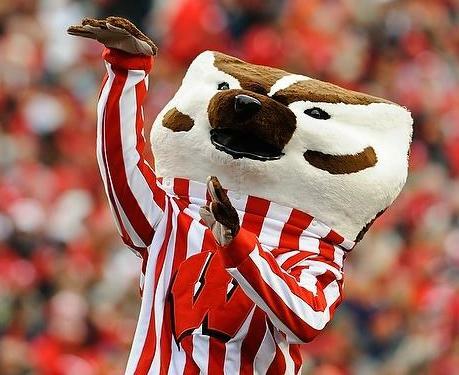 I am teaching stochastic processes again this semester. After enjoying a humorous exchange on twitter about the exponential distribution, I wondered about the practicality of the exponential distribution. Most of the examples from my notes seem a little idealized. For example, I’m almost positive that light bulb times are not exponentially distributed. Is anything really exponentially distributed? The amount of ink and graffiti on dollar bills that have been in circulation more than one year (a student who works for the Federal Reserve Bank provided this useful tifbit!). The useful life of things made from polyurethane foam, such as Nerf balls, car seats, mattress pads, and carpet pads (the useful life occurs after the break-in period and prior to the break-down period). The time between 911 calls (see below). The time between celebrity deaths. I looked at some emergency medical 911 data. The call volume changes over the course of the day, but the call volume is constant for a large part of the day. Looking just at that time period, I examined the interarrival times of the 911 calls. The exponential distribution is more or less a perfect fit! I don’t have any data for my celebrity deaths hypothesis, but since they are independent, like most 911 calls, then I would expect celebrity deaths to follow an exponential distribution. What else is exponentially distributed? Do you know how light bulb lifetimes are distributed? This entry was posted on Thursday, February 10th, 2011 at 8:59 am	and tagged with stochastic processes and posted in Uncategorized. You can follow any responses to this entry through the RSS 2.0 feed. « is there bias in predicting snowfall? I found this discussion about Light Bulbs and Dead Batteries. Excellent link–Thank you! I have never had a light bulb burn out quickly after I started using it, which I would expect for something exponentially distributed. Problems with the exponential distribution (and the central limit theorem in general) often show up in the tails. Methods may work well around the mean of the distribution that break down when used to predict more extreme events. From a quick check on our outgoing mail server’s yesterday logs, it seems that sending mail (including botnets) follows the same pattern. I am unsure though: It came from one (outgoing) mail server on a single day. You may want to check with your University’s postmasters for data to validate this. I’ve worked with some service purchase-time data that shows a pretty-close-to-exponential growth in purchase-likelihood as time to the purchased service approaches, at least once cyclical effects are taken out. The ability to use a parametric method of estimating the shape greatly outweighs any minor inaccuracies due to the exponential not quite fitting. Life times for certain computer components, such as physical disk drives, may be approximately exponential — some die quite young, but the ones that don’t tend to last a long time. I used to speak on the phone with my mother weekly. At some point she’d say “I’ll let you go now” and then launch into a new topic (or two) (or three). Eventually she’d say “I’ll let you go now” and either sign off or start a new topic. I believe exponential is the only memoryless continuous distribution, so I’m fairly certain the residual life of the call after the first “I’ll let you go now” was exponential. Is this an exponential existential crisis? 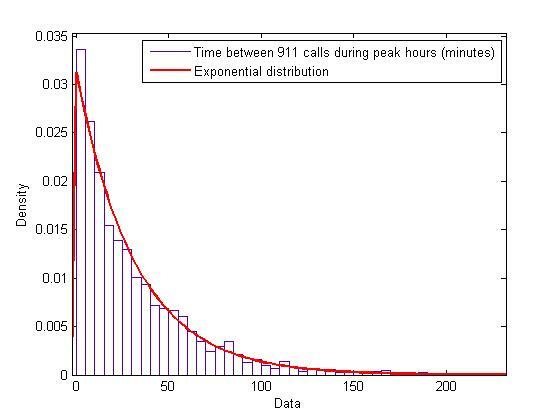 In a couple of studies I have been involved with for the police, the time between emergency calls in the UK did follow an exponential distribution with a time varying parameter. (The rate only changed slowly during the working day.) The time between reports of incidents on highways also does, so long as you only consider the first report now so many people use mobile phones (cell phones). Again, with a time varying parameter, the time between incoming calls to a call-centre does as well. One of my colleagues claimed to have evidence that the time between fatal crashes involving scheduled airliners in the world did as well, and used that as a demonstration that accidents “run in threes”. One happens, the most likely time for the next one is immediately afterwards, and then you are on the alert for the third case. I’ve had students in my discrete event simulation modeling classes do end of semester projects in which they have to observe a real system and build a simulation model to try to improve the performance of the system. In almost every case where you would expect a Poisson arrival process, the interarrival times (in some cases over many thousands of measured interarrival times) are almost exactly exponentially distributed. You do sometimes see Poisson arrivals with rates that vary over the course of a day. David, I have always hypothesized that the rule of thumb that celebrity deaths come in threes likewise has to do with the time between celebrity deaths being exponentially distributed. In fact, I discussed that during class when explaining the intuition behind the exponential distribution. Brian, Thanks for the experimental validation. I am surprised that the Poisson process is a perfect fit for so many processes. The intervals at which a molecule of water passes through the filter of an aquarium. Experimental validation is left as an exercise. Computer motherboards have a duel exponential curve that covers their mean time between failure. It is very high in the beginning and very low for 95% of life, then very high at the end of the expected life time. I think I’ve heard it called the “bathtub curve.” In the beginning, any flaws in manufacture will show up in the first few hours that voltage is applied, usually with catastrophic end of life results which is why they get powered and tested at the factory (if the manufacturer cares about returns that is! They can save time by simply having a pathological return policy!) and of course at the end of the life span the probability of one of the many parts failing starts to accumulate. Which is why I buy high durability motherboards for the heavy computation projects I do.